Bicycle Accidents | Eduardo De La Cruz-Munoz P.A. 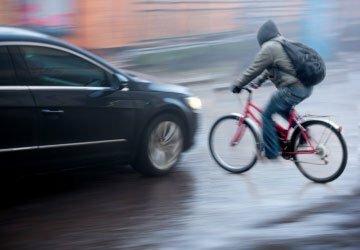 When negligent driving leads to bicycle accidents, which may result in severe injuries or even death, the driver of the vehicle should be held responsible. At the Law Office of Eduardo de la Cruz Muñoz, P.A., we are passionate about helping our clients challenge insurance companies and recover just compensation for their injuries and property damage following a bicycle accident. Collisions between a bicyclist and a motor vehicle may result in extensive injuries to the brain, skull, spinal cord, back, and neck. In severe cases, bicycle accidents can result in paralysis or even death of the bicyclist. According to a report published by the Center for Disease Control and Prevention in August of 2015, Florida has the highest rate of bicycling deaths of any state in the nation. In fact, the rate of biking accidents in Florida is more than double the nationwide rate at 0.57 per 100,000 people compared to the national rate of 0.23 per 100,000 people. If a driver was negligent and thereby caused injury, death, or harm to the bicyclist, they should be held accountable in a negligence claim. We will need to determine that the bicyclist had the right away and that the driver violated traffic laws or acted carelessly behind the wheel. Moreover, we will also need to prove that the driver's negligence caused the collision and that the victim's injuries were sustained as a direct result of the accident. Typical acts of negligence that may result in a bicycle accident include failure to yield, driving while under the influence, distracted driving, failure to use turn signals, speeding, aggressive, careless, or reckless driving, and so on.